One of the greatest experiences I had playing baseball was the first time of ever played baseball on national television. Playing on ESPN against the top college players in the country. USC and then UCLA. Not bad for a guy who was sitting the bench at the JUCO level in the middle of nowhere just the year before! The guy that I faced that night was Tim Murphy who was “touted” as being the top left-handed pitcher in the country at that time. I had never seen a pitcher top out at 93 mph before so this was going to be a challenge! A fun challenge. Luckily I had a game plan. He blew me away in my first at-bat but I had an idea of what I need to do next to hit the ball hard and get on base. Watch the video below to find out what I did! What’s your approach to hitting with two strikes? Leave a comment below to win! I’m giving away a free copy of “The Way of Baseball” to a random commenter! Let me know in the comment box below what your approach is with two-strikes to win a free copy of “The Way of Baseball”. Join The #1 Online Hitting Program To Increase Your Bat-Speed, Develop Your Power & Work On Your Hitter’s Eye-Strength. With Over 100 video baseball tutorials, interviews and PDF guides. 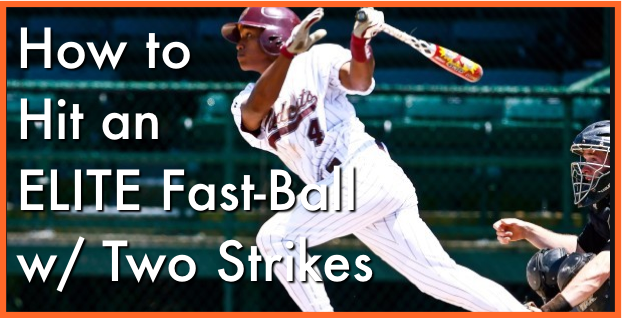 Previous post: How to Hit Effectively With the Bases Loaded!